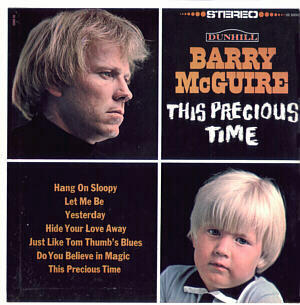 Barry McGuire is an American singer-songwriter. Following the success of the "Eve Of Destruction" single, Barry McGuire began working on another album for Dunhill Records with producer Lou Adler. Whilst he was recording he was reunited with some old friends from his folk days, as the newly-formed The Mamas & The Papas came to California. He invited them to sing backing vocals for him. The result of these sessions was This Precious Time, which took his music forward with a more sophisticated folk-rock-pop sound. It included one song written by John and Michelle Phillips of The Mamas & The Papas - "California Dreamin'" was first recorded here with the four of them singing backing vocals for McGuire's lead. Other songs on the album included more P.F. Sloan compositions, The Lovin' Spoonful's "Do You Believe In Magic", Bob Dylan's "Just Like Tom Thumb's Blues", The McCoy's "Hang On Sloopy" and two Beatles songs ("Yesterday" and "You've Got To Hide Your Love Away"). The album, though a strong one, was not a chart success - perhaps the media backlash "Eve Of Destruction" caused had permanently tarrred McGuire's name. "California Dreamin'" had all the makings of another obvious hit single, and he was going to release it, until John Phillips asked if maybe The Mamas & The Papas could release it instead. Impressed by what he saw, Lou Adler had signed them to Dunhill. They replaced McGuire's vocal track and added a flute solo, but otherwise used the same recording. Released as a single, this version gave them a massive hit and launched their careers. Denny Doherty sang lead on "California Dreamin'", not John Phillips. I am sure this paragraph has touched all the internet users, its really really nice paragraph on building up new website.